Our children are learning our sacred stories each week with help from each other, their teachers, and the SHINE curriculum. We are using a rotational curriculum that focuses on one story for 2 weeks. 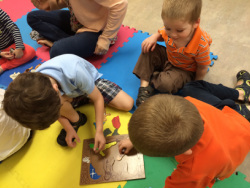 This allows the children to get a richer understanding of each Bible story through art, drama, games, and much more. To learn more about the Shine curriculum we are using visit: www.shinecurriculum.com. Our Middle and High School youth are using the Shine Youth curriculum as they become more familiar with moving toward adulthood and our sacred stories. They meet at Lifeline Chaplaincy, one block from the church. Children and youth are invited to serve as acolytes each Sunday. 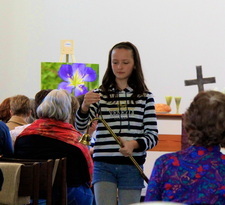 As acolytes the children and youth are worship leaders and begin the worship service by lighting the candles. At the service's conclusion the acolyte carries the light out to symbolize all who go as light of the world bringing in the light of God's presence. We provide training for interested children and youth. Sign-up sheets are located in the kitchen. Covenant's deacons launched the Youth Mentoring Program in 1991. The program pairs each middle school and high school student with an adult for a year to explore what it means to be a Christian and what it means to be a part of Covenant. Click here for more details and an application to participate.